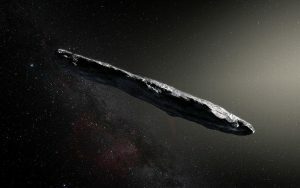 According to a newly-released paper from two Harvard astronomers, Oumuamua, a mysterious, cigar-shaped object that whizzed through our solar system last year, might actually be an alien probe from interstellar space. The authors of the paper are Shmuel Bialy (a graduate of Tel Aviv University) and Avi Loeb (a graduate of the Hebrew University of Jerusalem). Oumuamua, which means “messenger” in Hawaiian, is about a quarter of a mile long. It flew by on a trajectory that indicated clearly that it did not come from within our solar system, and it actually accelerated during its journey. Oumuamua appears to have been powered by solar radiation pressure, the force behind what’s known as lightsail technology, a means to accelerate spacecraft once they’re flying free.